In August of 1967 members of the original Rising Suns from Topeka, Kansas met with John Brown of Mid-Continent Entertainment about going back on the road. In January of that year they had been involved in a wreck as they were leaving Topeka for a gig in Minn. This wreck destroyed their equipment and injured several of the band members. Since the new Rising Suns from Coffeyville, Kansas were doing such a good job it was decided that a new name and new beginning was needed and the name The Young Raiders was chosen. For the next four years as the Young Raiders and later until 1978 as Southern Flavor, this road band racked up over a million miles and played close to 3000 gigs, eventually performing in all 50 states and Canada. They once played 63 nights in a row took a night off and played the next 24. 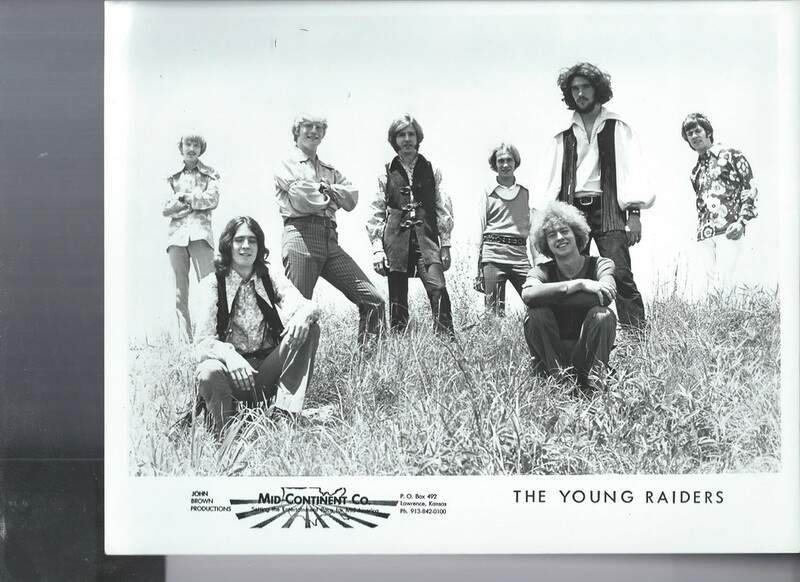 Some of the best musicians in the Mid-West would play in the Young Raiders as musicians would come and go but the band always kept its signature sound of a rock rhythm section, three rock horn players and several lead vocalists. There was nothing subtle or measured about the band. Usually eight piece, they did their best to sound like 12 on every gig and a good gig was one that had the crowd in front of them in a near riot before they left town. Once asked to do a Broadway show medley like their good friends, the Flippers, the Young Raiders chose to do their version of the Rock Opera Tommy by The Who with Young Raider horns (of course). In 1970 an album was recorded at Audio House in Lawrence which was never released but can be heard on-line and in 1977 another group of songs was recorded in Jackson, Miss. with the same results. Besides being Mid-Continent’s “blue collar” band who would perform in nearly every venue in the Midwest as KOMA radio broadcast their ads over the Midwest, the band also opened for legends such as The Marvelettes, Poco, The Buckinghams, Kenny Rogers, The Righteous Brothers in Hawaii and Ike and Tina Turner in Canada.